Dave King has urged Rangers supporters to vote in the forthcoming general meeting by proxy, even though the event is now being staged at Ibrox. The directors after a second London hotel declined to host the meeting. King has also urged Rangers supporters to curtail their anger at the current board and focus on voting them off. "It is not the Rangers way to threaten individuals and there should be zero tolerance for this," he said. Shareholder King requisitioned the extraordinary general meeting and has lodged seven resolutions to be voted on by shareholders: the removal of all four current directors - David Somers, Derek Llambias, Barry Leach and James Easdale - and the nominations of himself, Paul Murray and John Gilligan. The deadline for the meeting is Friday 6 March and King is adamant that the board has an obligation to stick to this time frame. It was originally due to be held at the Millennium Hotel on 4 March, and when that hotel pulled out, the Grange Hotel in Tower Bridge was arranged for the same date. That hotel then pulled out, citing the "comfort and security of our guests and staff". Both hotel venues could hold fewer than 1,000 people, while more than 2,000 shareholders have attended the last two annual general meetings of Rangers International Football Club. King is confident that his resolutions have the backing of more than 50% of shareholders, and he has urged them to continue to cast their votes by proxy or by post. "The proxy process must continue as planned," the Johannesburg-based businessman said. "It is absolutely vital that Rangers fans, who are shareholders, and all other shareholders continue to follow procedure. 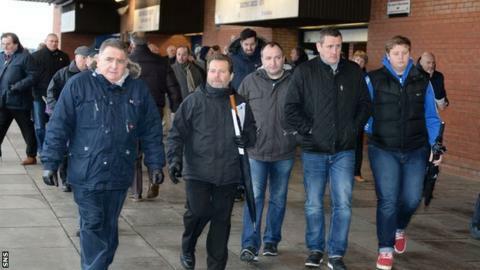 "There has been coverage in the media alleging concern by club directors about their personal safety and verbal abuse from Rangers fans and while unrest is understandable any anger must be peacefully channelled towards the removal of directors from the board. "While Ibrox can easily accommodate everyone who wants to go, I believe fans who are also shareholders should still ensure that a properly completed proxy is in place beforehand. The meeting will last only a few minutes as there is no debate beforehand. "It was always my intention to vote by proxy and not travel to London and it remains the case that I will be in Glasgow with my fellow directors ready to commence the business of the day." Meanwhile, the Rangers Supporters Trust, which has purchased shares on the fans' behalf, is asking members not to attend the meeting "unless they feel they have to", stressing that it is their vote and not their presence that is crucial.